Tim makes pushing a kid up a hill while riding his own bike look easy. Like anything else, it takes a lot of practice. And enduring a little (or a lot of) yelling from the kid because you steered him into the curb or the bushes or a parked car. Last summer I pedaled a little too close to the 5–year–old while giving him a push and scraped his tender little 5–year–old leg with my pedal. He was not happy. And of course, I felt really bad every time I saw the 4 inch long pedal mark on his leg. I’m better at it now—I can push him up all five hills without incident. Hopefully, by the summer he will no longer need pushes. I’m looking forward to being left in the dust. This entry was posted in alternative transportation, bikes, kids and tagged Family Cycling, riding with kids. Bookmark the permalink. Hey Anne — you may not remember me, but we met on one of the ABR-organized cargo bike rides last year. I’ve recently had a Madsen Cargo Bike (see http://www.madsencycles.com) shipped up to Seattle, and I’m hoping to get it looked at by some of the notable family/cargo riders around town. I wondered if you and Tim might be interested in taking it for a spin for a few days and writing about it/sharing your impressions. I know the owner/designer, and he is planning to be up here for the Bike Expo this weekend as well. I’m hoping to help drum up a little bit of interest and thought you all might be curious to have an early look. If so, e-mail me and I’d be happy to arrange to get it to you all for a few days…. Keep up the great riding! Hmm, I think I need your husband (or you!) along to help me out with some of the hills on my commute. 😉 very sweet post! Don’t work about the scars on your son too much. They’ll fad quite a bit. My two year old daughter has one on her forehead from a bump last year that you can make out if you really look for it. For boys, I’d think he would call it a badge of honor. ghd, Sounds great, we’d love to take it for a spin. I’ll shoot you an email. Guy – the boy does proudly display his scars. I love the little stories that go along with them. Oy- I have trouble pushing while walking. Particularily while crossing a big street. I always make her veer the wrong way, glad to know others do too. I don’t think I could do it while on a bike!! I’d be curious if some of the build quality issues have been resolved with their second container of bikes. Hope to see you on the next ABR ride … anyone know when that is, by the way? 1 day notice didn’t really work out for us last time, but I appreciated the heads up from Tim and Anne. The first time I witnessed the parent/child cyclepush was on the STP. 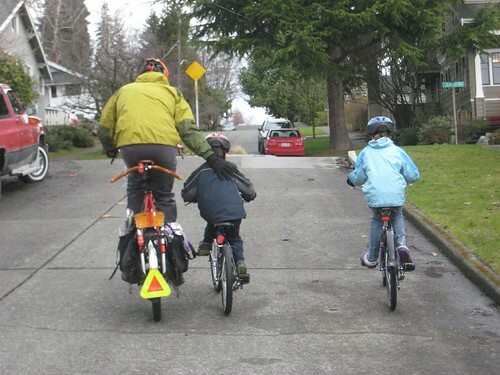 A carbon dad was pushing his 10-yr old 10-spd daughter up the Canyon Road hill…and they were passing everyone. It’s an impressive sight when properly executed. Well, so far my success with the cyclepush has been limited. I have a son who tends, for some reason to steer directly into me whenever I get alongside him. It is a bit nerve-wracking. he is getting better, and can generally get himself up the hills now anyway, now I just need to work on his sister. I currently have four that ride in the Madsen, yes I have one too. I went and got it directly from the Madsen warehouse. It was a fun opportunity to meet Jared in his natural habitat. It was also fun to play ping-pong with Jared and Sean in the warehouse while my wife tested out the bike. (Thanks guys) Jared was working on the rain cover prototype while we were there. Looks exciting. your brother in law was just over! and we started chatting – and i then i realized who you are! my kids go to the same school as maddy does. and thomas and i are on the same cyclocross racing team. so funny that you guys are related by your sis! AND that you have 2 xtracycles! thomas works only a few blocks from where i work at xtracycle. so interesting how the bike scene is so interconnected. Cute. For some reason the idea of pushing a child on a bike into a bush is amusing (as long as everyone’s okay!) – probably because I can imagine how offended my 5-year-old nephew would be if I accidentally did that to him. Just wanted to let you know I added to my badges (scars) yesterday. Nothing broken. Just a bit embarrassing. Hey Gavin, Yes – steering straight is the key (for the kid and the pusher). Unfortunately, it takes practice and all parties have to go through a little pain until you get it down. lauren – I sent you a note on your blog. Yes, it’s funny how the biking internet world is connected! At first, I thought you found our blog through Thomas..but it must have been through Xtracycle? ?